The Riverside County Transportation Commission and multiple partners are asking motorists to make the most of their commute by relaxing on the bus or train, sharing laughs with fellow carpoolers and vanpoolers, getting fit by biking or walking to work – all with a chance to win great prizes during Rideshare Week, October 1-5. Commuters who make the pledge at iecommuter.org and rideshare at least once during Rideshare Week are eligible to win oodles of great prizes, including bicycle, a tablet, a two-night stay at the Hyatt Regency in Indian Wells, lift tickets and activities pass for Big Bear Mountain Resort, a living room set from Ashley Furniture, gift cards and gift baskets galore, and much, much more. 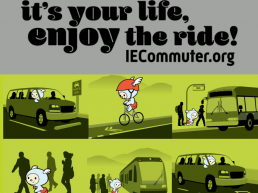 For a complete list of Rideshare Week sponsors, prizes, and contest details, visit the iecommuter website. In addition, please note that if you are enrolled in an employer-based ridesharing program through IE Commuter and need to work late or get home for an emergency, IE Commuter offers a guaranteed ride home via transportation network company, taxi, rental car or transit. Click here for more information.